Pancreatic cancer has one of the worst prognoses with 5-year survival below 10%. There is some evidence that alcohol consumption might increase the risk of pancreatic cancer. We examined associations of pre-diagnostic alcohol intake with (i) incidence of pancreatic cancer, and (ii) overall survival following pancreatic cancer. Usual alcohol intake was estimated at recruitment in 1990–1994 for 38,472 participants in the Melbourne Collaborative Cohort Study using recalled frequency and quantity of beverage-specific intake for 10-year periods from age 20. Pancreatic cancer incidence (C25 according to International Classification of Diseases for Oncology) and vital status were ascertained through to 30 September 2015. Cox regression was performed to estimate multivariable-adjusted hazard ratios (HRs) and 95% confidence intervals (CIs) for associations with lifetime, age 20–29, and baseline alcohol intakes. By the end of follow-up (average 20.2 years), 239 incident cases of pancreatic cancer were diagnosed, of which 228 had died. 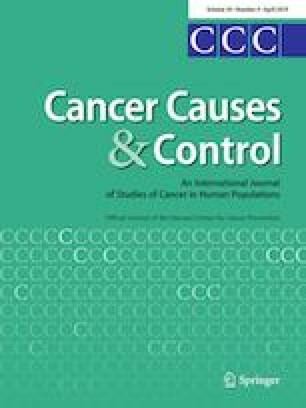 No evidence of an association was observed between alcohol intake and risk of pancreatic cancer. Higher lifetime alcohol intake was associated with lower overall survival following a diagnosis of pancreatic cancer (mortality HR 1.09 per 10 g/day increment, 95% CI 1.00–1.19; p value = 0.04). A similar finding was observed for age 20–29 intake (HR 1.09 per 10 g/day increment, 95% CI 1.02–1.18; p value = 0.01) but not with baseline intake. We observed an association between lower alcohol use from an early age and improved survival following pancreatic cancer, but this finding needs to be confirmed by other studies. The online version of this article ( https://doi.org/10.1007/s10552-019-01146-6) contains supplementary material, which is available to authorized users. We thank the original investigators and the diligent team, who recruited the participants and who continue working on follow-up, for their contribution. We also express our gratitude to the many thousands of Melbourne residents who continue to participate in the study. MCCS cohort recruitment was funded by VicHealth and Cancer Council Victoria. The MCCS was further supported by Australian National Health and Medical Research Council Grants 209057, 251553, and 504711 and by infrastructure provided by Cancer Council Victoria. JLH is a NHMRC Senior Principal Research Fellow. RR’s position was funded by the Foundation for Alcohol Research and Education. The funding sources played no role in the study design, in the collection, analysis and interpretation of data, in the writing of the report, and in the decision to submit the article for publication.